Spending a summer in Texas? Pick up the necessary gear and enjoy the state’s great outdoors. Whether you plan to escape the summer heat by relaxing seaside on the beautiful beaches or exploring the coastal gems near Galveston or Corpus Christi, you’ll have everything you need. From floating on Texas’ rivers to outdoor activities at beautiful state parks, summer in Texas can be full of adventures. Ready for a Texas-style camping adventure? Get the whole family outside and under the stars with this affordable tent from AmazonBasics. With room to sleep 8 and a detachable rainfly, your crew will love spending those cloudless nights watching for shooting stars, or mapping out the constellations. Get away from the light pollution of big cities and commune with nature, without breaking the entertainment budget for the entire summer. Whether you’re out late enjoying that after work summer sun, or watching the local little league team play ball, an oversized cooler lets you keep refreshed and hydrated. Some chilled juice pouches or applesauce can help entice small snackers into taking regular breaks, even if they fight your attempts to get them to drink water. This 14” portable charcoal grill from Weber is great for camping or picnics. Place it on a wooden picnic table to keep it at perfect grilling height. Right-sized for single, couples, or small families looking to enjoy that extra oomph of summer flavor on a burger, taking it along on family camping trips or the next tailgate and wow the crowd with a great performance from a small, easy to use a grill. Great for tailgating, beach trips, or backyard barbeques with the neighbors, this easy up sun shade makes sure there’s always a cool spot to be found, even on those blistering hot summer days. Clip a couple of battery operated fans to the frame and stay comfy all day. 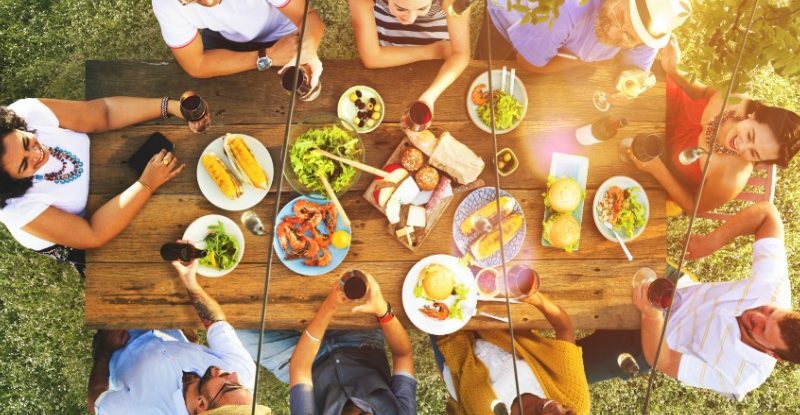 If summer isn’t summer without grilling and cooking out, make sure the designated chef of your family or friend group has all the tools they need. Skewers for kebobs and corn holders for sweet, buttery ears of grilled corn make for no-fuss meals with nearly no clean up after. Complete with a grill brush, knife, and basting brush, you’ll only need to pack the plates and utensils- and the food, of course. Wearing the right footwear for your outdoor adventures is essential. A comfortable pair of flip flops makes a beach trip enjoyable, but if you’re headed out to a higher vista, a secure pair of boots will keep you safe and comfortable as you traverse the miles. When the days are long and hot, enjoy the respite of a cool night with a pleasant breeze. Bring the folding chairs and pile up outside around a fire pit. Teach the kiddos how to roast marshmallows and hot dogs- bonus points for teaching them how to trim their own roasting sticks. Nothing beats a lazy float down the river on a warm summer afternoon. Intex’s 53” river run tube is certainly more of a splurge than the noxious neon floats from the local dollar store, but it lasts for years, actually holds an adult comfortably, and the mesh bottom panel means you can bring along necessities (like car keys) in a floating waterproof bag and actually be able to find them when you need them at the end of your journey. Formulated to go on even over wet skin, lessen the re-apply hassle with Neutrogena’s spray on sunscreen. Great for sweaty kiddos at soccer practice, beleaguered parents at the beach, and keeping skin safe while mowing the lawn. Keep sun damage at bay with this stylish straw Panama hat. An adjustable interior hat band keeps it snug yet comfortable, and neutral colors make it easy to mesh with any outfit or style; or pick up one in a punchy pink for a vibrant splash of color. Character print towels may be fun for little ones, but a set of well-made matching towels can be used year after year, long after those princess/emoji/little yellow monsters are outgrown. A four pack of distinct colors make it easy to remember which towel belongs to who, so there’s no arguments about who forgot to hang theirs up to dry, again. Keep the whole neighborhood entertained with this bulk set of sidewalk chalk. Bring back that summer nostalgia and let parents play along. See who can have the most outstanding mural, at least until the next summer storm washes it away and the game starts over again. Bring back the classics with these sacks, perfect for teaching kids about potato sack races. Pick up a set of (batons, rope ribbon) and you’ll hit the summer camp trifecta with three-legged races and baton passes. If you’re starting a war, make sure you’ve got the ammo necessary to win. Down those water-gun punks with a multi-pack of water balloons. An easy fill nozzle makes it easier to prepare in bulk. Every time you get hit, it’s cool and refreshing, so even the losers have a good time. Drop a couple of beads of food color into the balloons before filling for a rainbow splatter party. A 16’ diameter means tons of room for flips and tricks on this family sized trampoline. The secure netting keeps those little acrobats safe while they perfect their routines. Set up a sprinkler nearby for a splash pad experience without leaving the backyard. If you’re bringing pets along to the river, the beach, or a muddy hiking trail, make sure you’re prepared to bring them home again. Good car covers mean never sacrificing your vehicle to stains or smells, no matter how many adventures you have with your best travel companion. Starting a summer garden has never been easier. Just a few basic tools, and the time and patience to water, nurture, and cultivate, and you’ll enjoy a bountiful harvest. For a unique mix, pick up a heritage favorite from a trusted provider like Victory Seeds. You’ll be surprised how easy it is to have fresh beans, tomatoes, or jalapenos growing in pots all summer. Get set up on a steep hill and keep the whole family laughing with this generously sized slip and slide. Hook up the water hose; the entire length of the slide is covered by the sprinkler system, so sliding is comfortable and easy, with no dry patches and no need to add a little dish soap. Line up a row of empty bottles and cans and see who has the best hand-eye coordination. Reusable beads make this Daisy slingshot a long lasting toy, and a less than 10$ price tag means you can afford one for every kid, so they can play- and compete- side by side. Save on those excessive cooling bills with a programmable learning thermostat that can be adjusted remotely. Great for any home, they’re particularly useful for rental or vacation homes, which are often unoccupied for long stretches at a time. You’ll never waste money heating or cooling an empty home again.